Fifty years after its founding, Reston is still living by the principles of its founder, Robert E. Simon. Master of Ceremonies Chuck Veatch — one of the original salesmen for the “New Town” back in the 1960s — read Simon’s words from Reston’s dedication at the Founder’s Day celebration at Lake Anne Plaza on Saturday. 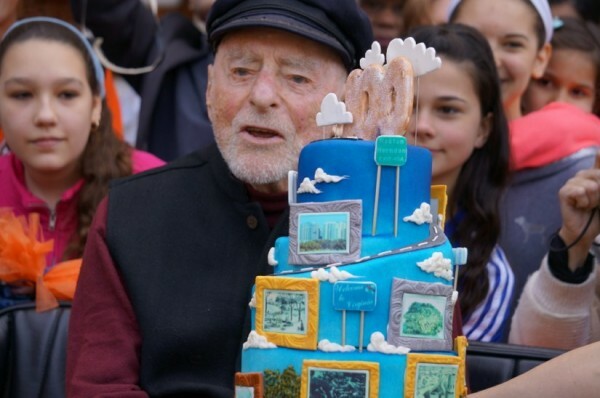 Several hundred people — some of them original Restonians or children of original Restonians — were in attendance Saturday for the celebration of Reston’s 50th birthday and Simon’s 100th birthday. Also paying tribute — Gov. Terry McAuliffe; Lt. Gov. Ralph Northam; Sen. Tim Kaine; Rep. Gerry Connolly; County Supervisors Sharon Bulova and Cathy Hudgins; and Virginia General Assembly members Del. Ken Plum and Sen. Janet Howell. President Barack Obama also sent his regards in a letter to Simon. Reston’s place in history was was a top topic during the tributes. In Virginia in 1964, segregation was alive and well. Simon envisioned an open, inclusive community where people of all races, ages and incomes could live. 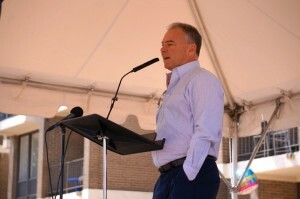 Sen. Tim Kaine, who also served as governor of Virginia from 2006 to 2010, put Simon’s vision in perspective. “In 1964, when Reston opened, discrimination was rampant and legal,” he said. “It wasn’t until 1968 that the federal Fair Housing Act was passed. It wasn’t until 1971 that the Virginia General Assembly passed the South’s first fair housing law. Other Founder’s Day fun including musical performances from South Lakes High School, Terraset Elementary School and Hunters Woods Preschool; honoring the second and third generations of Restonians who have returned to live and work here; and a dedication of commemorative bricks and a historical marker; and, of course, birthday cake.